One week after upsetting the Charlotte Independence (USL) in the Second Round of the Lamar Hunt US Open Cup, the Ocean City Nor'easters return to the state of North Carolina looking to upset another professional team. The winner of tonight's game will advance to Round 4 of the tournament where they will face a team from Major League Soccer. That would be tremendous birthday present for Nor'easters head coach John Thompson and operations manager Peter Bader. The identity of that MLS team is scheduled to be revealed on Thursday, May 24. The Nor'easters kicked off the 105th edition of the tournament with a 3-0 road win over AFC Ann Arbor (NPSL) on May 9. Williams N'Dah, Simone Raioli and Fredlin "Fredinho" Mompremier each scored, while Deri Corfe had two assists. Alec Smir made seven saves to preserve the shutout. "Doesn't matter if it's @ManUtd or @CLTIndependence." They followed that up with a 3-1 road win against the Charlotte Independence on May 16. Kyle Gurrieri stunned the home crowd with two goals in the first seven minutes of the game, while Mompremier scored his second goal of the tournament before halftime. Corfe added two more assists, giving him four helpers total, which currently leads the tournament. It was the 11th win in Ocean City's PDL history (12th overall) and the club's sixth pro team upset. Only two amateur teams in the country have more wins and pro team upsets in the Modern Era (1995-present). North Carolina FC, formerly known as the Carolina RailHawks, have a rich history in the US Open Cup that began in their inaugural season in 2007. That year, they won four games in a row, including a 1-0 win over the Chicago Fire (MLS) to become the first North Carolina team to reach the Semifinals in tournament history. They would fall to the eventual champion, the New England Revolution, 2-1 in extra time. Since then, NCFC have upset four more MLS teams and have reach the Semifinals of the tournament. They have benefitted from playing the vast majority of their Open Cup games at home. Of their 30 tournament games in club history, 26 of them have been played at their home stadium in Cary. They have an 18-6-2 (1-1 in PKs) record at home. They added another home win to their Open Cup resume in Round 2 when they defeated the Lansdowne Bhoys FC, the defending Amateur Cup champions from New York City, 3-0. Connor Tobin, Marios Lomis and Bernard Luxbacher all scored for NCFC in the victory. Former Liga MX goalkeeper Austin Guerrero earned the clean sheet. NCFC started off playing in the USL First Division, before leaving to join the North American Soccer League in 2011. However, after the 2016 season, they left the NASL to join the United Soccer League. Just like how the Charlotte Independence featured Mutaya Mwape in the last round, North Carolina FC also features a former Ocean City Nor'easters player. Steven Miller played three seasons with the Nor'easters (2008, 2009, 2011), finishing with eight goals and five assists. 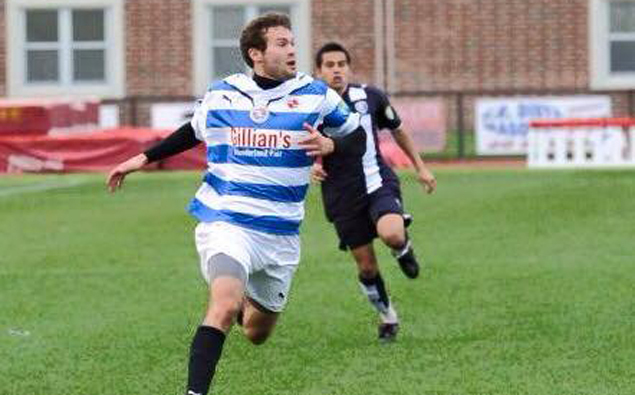 He was part of the 2009 Ocean City team (then known as the Ocean City Barons) that upset two professional teams and reached the Third Round of the US Open Cup. That year, they would play, and narrowly lose to D.C. United of MLS, 2-0. Modeled after England's FA Cup, the US Open Cup is a single-elimination tournament that is the second-oldest continually-operating competition of its kind in the world and has been the national championship for the United States since it launched in 1913. The tournament is open to professional and amateur teams from MLS to Sunday beer league teams and everything in between. The 105th edition of the US Open Cup started with 97 teams, 20 of them from the PDL. Based on their 9-4-1 regular season record last year, the Nor'easters were among the Top 20 teams in the league and qualified for the 2018 edition of the competition. The Nor'easters are one of the most successful amateur teams in the country when it comes to the US Open Cup. Only two amateur teams in the country (Michigan Bucks and the Des Moines Menace, both of the PDL) have more Open Cup wins (11) and professional team upsets (6) than Ocean City has as a PDL team. Of those six wins over professional opposition, the first five of them were shutouts in front of their home fans at Carey Stadium, outscoring the pros by a combined score of 10-0. The first pro upset came in 2005 with a 4-0 win over the Long Island Rough Riders (USL-2). The next two upsets came in 2007 and 2009 against the same team, Crystal Palace Baltimore. They followed up that 2009 win with a second straight stunner, a 1-0 extra time win over the Real Maryland Monarchs (USL-2). That earned them a date with D.C. United of Major League Soccer. They traveled to Maryland and lost a close 2-0 decision to the defending Open Cup champions. In 2013, the Nor'easters claimed their fifth professional victim with a 1-0 win over the Pittsburgh Riverhounds (USL), which earned them they advanced to Round 3 again where they had a chance to upset the Philadelphia Union (MLS). In that game, Emmanuel Kollie scored a 90th minute equalizer for Ocean City at PPL Park, but their upset hopes were dashed when the Union scored a controversial game-winner in second half stoppage time. Last year, the Nor'easters defeated Junior Lone Star FC (Philadelphia Premier League) 3-1 before holding the Harrisburg City Islanders (USL) to a scoreless draw in Round 2. Ocean City were eliminated in penalty kicks, their first PK shootout in club history. The Nor'easters are currently 1-1 in the regular season in the Premier Development League. Last Saturday, Ocean City lost their first game of the season, a narrow 1-0 loss on the road against the Long Island Rough Riders.